Did you notice our website has changed slightly? Perhaps you didn’t because the change was so seamless. Our website has recently migrated from a WordPress platform to Squarespace. The design hasn’t been compromised and instead our website receives a multitude of benefits Squarespace is renowned for. For years we have designed and constructed websites for our clients that meed the operational and design needs; all on Squarespace, and so we decided it’s time we took our own advice and moved to the platform for Of Note. 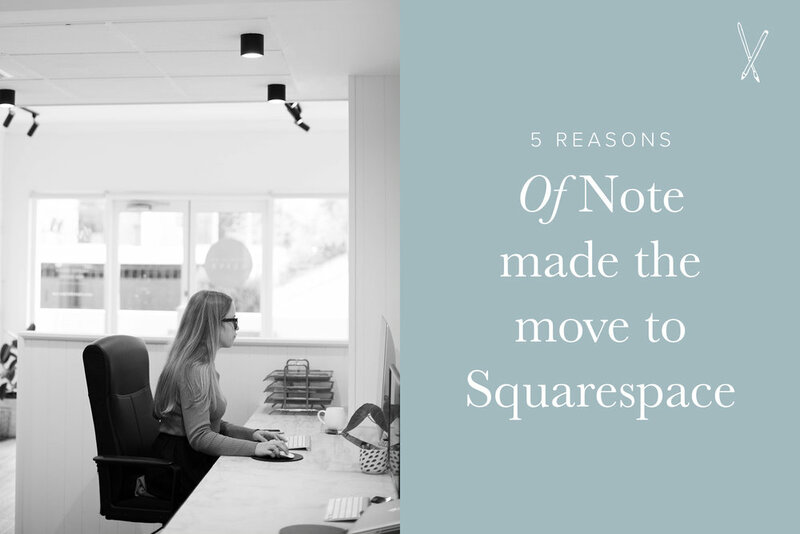 Below we share the reasons we feel Squarespace is the perfect platform for almost every small business and why we recommend our clients choose the platform to host their website. Day to day we deal in website code, customising your site to meet your operational and aesthetic needs, but there comes a point when your design is complete, and your content is uploaded that you’re ready to take the reins. Of course, before we leave you to manage your new site, we provide a one-to-one tutorial on how your CMS (content management system) works and how to make changes, but we LOVE that Squarespace has a simple back-end management platform that is straightforward and easy to use. Many Of Note clients are small or medium business who love the flexibility of being able to jump in to the back end of their website to make a change themselves! When things do get tricky, Squarespace has an entire site dedicated to helping you navigate to the find the solution to your question or query if you’d rather manage your site independent of the Of Note team. Videos, step by step guides, community forums, webinars and even human beings are ready to answer your questions and help you to manage your site independently, without the need to invest your hard-earned funds into seeking professional help. Don’t forget, we’re always here if you need us and have affordable maintenance packages that some of our clients choose for peace of mind. Perhaps one of our primary reasons for our change to Squarespace was the results we were seeing for our clients in their SEO results (search engine optimisation). Squarespace automatically builds in a whole host of SEO tools without the need for plugins to ensure the content on your site ranks well on google. Avoid investing too much time in you SEO by utilising the ‘page details’ and ‘search engine descriptors’ provided. Squarespace also generates a sitemap for your site to make sure Google can ‘crawl’ your pages to view your carefully crafted content to share with your potential audience. One misconception about Squarespace is that the platform can be limiting in a design sense, which isn’t’ true. Due to their clean coding, our team can design creative solutions that meet your needs and requirements with a beautiful, custom design. Squarespace designs are fully responsive and automatically adjust for mobile use. A few coding tweaks can ensure your design is seamless from desktop – laptop- tablet- mobile. Squarespace is investing into their compatibility with other platforms to ensure your administration is as straightforward as possible. From Mailchimp to Xero to PayPal, YouTube and more Squarespace works harmoniously with your other favourite programs. With security a paramount priority for the team, we’ve found fewer spam emails, fewer hacks and an overall more pleasant experience. To find out more about creating your website using Squarespace or about migrating from your existing platform, contact our team today.